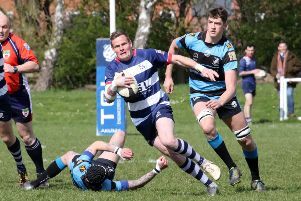 Banbury Bulls slipped to their third successive Wadworth 6X South West One East defeat at Old Centralians. But far worse than the 22-6 defeat was the loss of last year’s player of the season Jimmy Manley with a serious injury. Bulls had 12 players unavailable for Saturday’s fixture and suffered another devastating blow in only the third minute when Manley’s planted leg was trapped under a tackle, resulting in a broken fibula and dislocated ankle. An ambulance was called for the second time in two weeks and the game was delayed for 45 minutes while paramedics attended to Manley. The game was restarted after both teams had warmed back up and Bulls did well to switch back into game mode after such a serious injury and a long delay. Old Centralians took the lead with a break from the halfway line. Showing some good hands and taking advantage of two-on-ones Ross Hannaford scored in the corner. Sam Carr-Archer limped off with a knee injury to further complicate things further for Bulls. Old Centralians went further ahead when a Sam Stoop pass was intercepted by Robert Winchle who sprinted his way over in the corner. Ed Phillips kicked Bulls into the game at the start of the second half after Old Centralians were penalised for being offside. The momentum was all with Bulls at that point but Old Centralians’ defence was solid and the visitors could not find the try their play deserved. Bulls settled for another Phillips penalty after Old Centralians were penalised for not binding on to the scrum correctly. Despite the good spell for Bulls, it was Old Centralians who increased their lead. Owen Chandler caught an off-load and sprinted his way over under the posts with Wayne Mulhern converting to make it 17-6. With a victory no longer possible, Bulls heads started to drop and Old Centralians scored another late try in added-time when Craig Ballinger drove over from close range.